You’re planning to invite social media influencers to visit your facility, and you’ve planned their experience, but what will they leave there with? Let’s look once more to NASA and their exemplary social media outreach program! 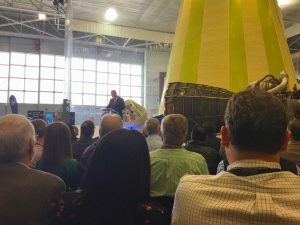 Thirty social media influencers and I were invited to tour the Marshall Space Flight Center’s facilities and attend NASA Acting Administrator Robert Lightfoot’s 2018 State of NASA address. 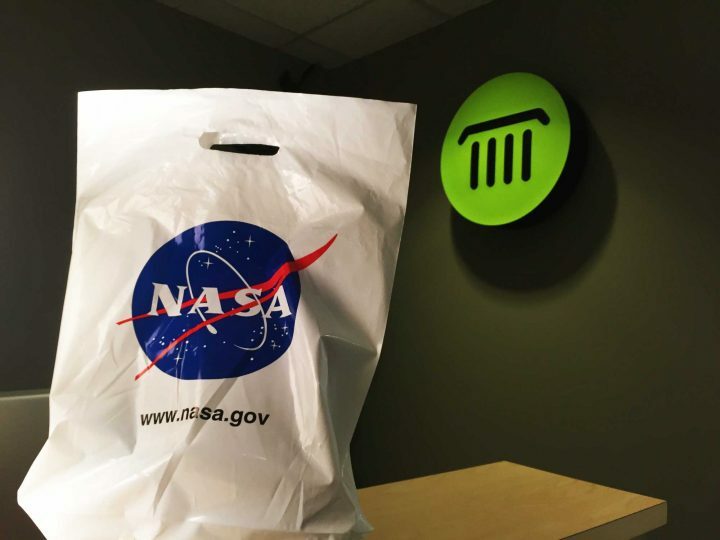 It was an incredibly intense and information-dense visit, and at the end of the day, each attendee was issued a sturdy NASA-branded plastic bag containing mementos and a folder stuffed with printed materials. The bag itself is clearly-branded, strong and waterproof. That’s all you need. The mementos pictured at the top of the above photo included a notebook, a pin, a few bookmarks, and a sticker. All of those are relatively affordable ways to thank your visitors for spending a whole day at your facility. 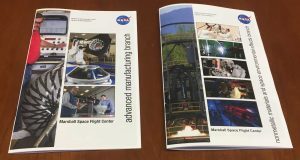 They also included a beautiful 2018 calendar full of amazing International Space Station photos, which will remind recipients for a whole year that Marshall Space Flight Center is the home of the ISS Payload Operations center. If you are proud of what your facility does, like “coordinate all U.S. scientific and commercial experiments [on the ISS],” showcase that! Do keep in mind that while a calendar for this year is a great choice at a February event, your visitors may not find them as helpful in September. Let’s explore the most valuable thing NASA sent us home with: supplemental information! Why would anyone read this stuff? That was a thing I saw. It was engaged in a freedom-of-motion test. A scientist said the name of that machine, but say I couldn’t quite hear him. How would I know what to refer to it as later? 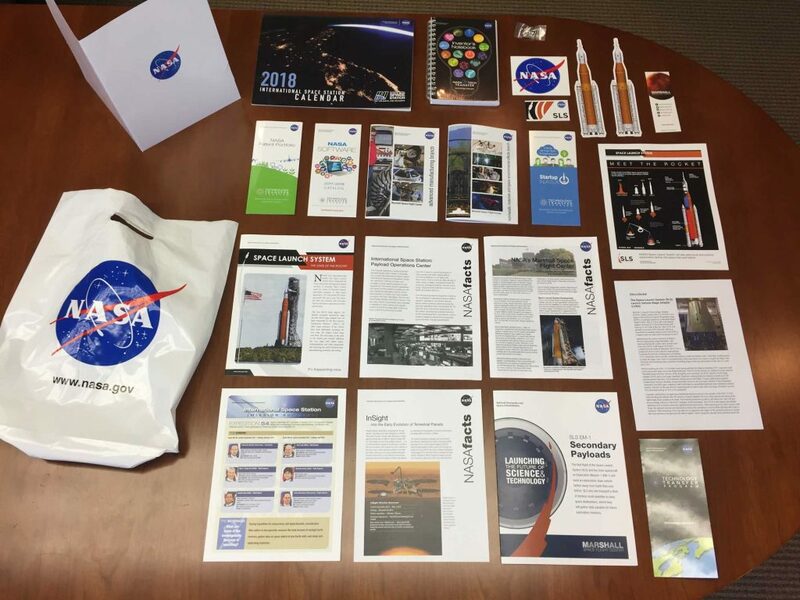 All is not lost, because NASA provided us each supplemental materials about every stop of our tour! The two most comprehensive booklets were 20 and 28 pages long, allowing me to easily cross-reference what I saw with detailed information I can include in my write-ups. Thanks to the thoughtful inclusion of these booklets, I can write with confidence that this is a an Automated Fiber Placement Robot operated by the Advanced Composites Manufacturing team. It’s used to create composite tank components! If you aren’t already routinely preparing these materials for visitors, you don’t need to jump straight into 28-page booklets. We were provided several simple double-sided fact sheets as well. Others provided a deep dive into just one of the features of our tour. The SLS partially foam-coated Launch Vehicle Stage Adapter served as a colorful backdrop element during Acting Administrator Lightfoot’s speech, and warranted a singularly focused and detailed double-sided fact sheet. If there’s something visually striking at your site that you expect to appear in your visitors’ posts, provide whatever information will allow them to answer their followers’ questions about it. What parts of our tour are the most information-dense? What environments will be visited that may be acoustically challenging? 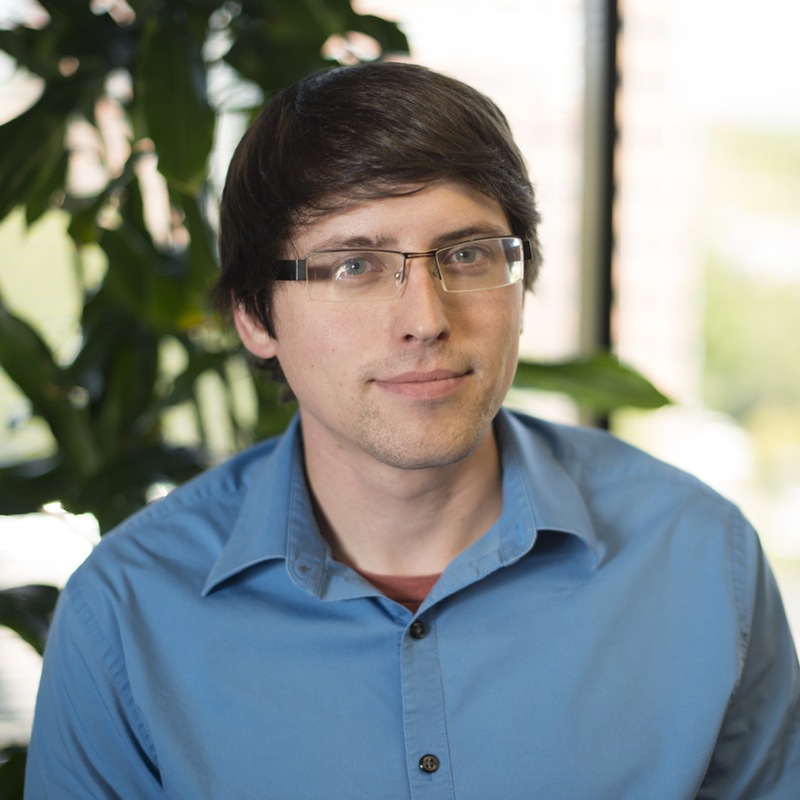 What pieces of information are vital to be recounted accurately? By ensuring everything in your bags augments the attention, hearing or memories of your visitors, you can deliver a NASA-grade experience! If you’d like to see more photos, video, and information about my personal experience at NASA Social 2018, please check out my twitter thread at: https://twitter.com/joehills/status/963052670352322560 and my YouTube video about my trip.